Following his tumble in the latest Newspoll survey, it's time to compare the Liberal leadership aspirants behind Malcolm Turnbull. Joe Hockey and Tony Abbott, the two Jesuit-educated Sydneysiders, are the frontrunners should the embattled Turnbull fall before the next federal election. They and retirement-bound Peter Costello are featuring in surveys by NewsPoll to find the best Liberal leader. In the most recent poll the rank order was Costello 36 per cent, Hockey 20 per cent, Turnbull 16 per cent and Abbott 10 per cent. MPs take a range of factors into consideration when choosing a leader. The most important, given the relatively equivalent capacity and experience of Abbott and Hockey, are potential to win the next election, policy positions and factional alliances. The stage of the electoral cycle makes a difference too. After the November 2007 election Brendan Nelson prevailed because Turnbull's electoral appeal was discounted by enough right-wingers who were willing to back Nelson on policy grounds. By the second contest last year, with Nelson struggling in the polls, Turnbull triumphed because the next election was getting closer and success now seemed more important. There are some similarities between Abbott and Hockey, including parliamentary and ministerial experience. Abbott entered parliament in 1994 and Hockey is part of the much trumpeted Class of '96. They both became ministers in the Howard government after the 1998 elections. Abbott moved upwards more quickly than Hockey for a while, and served as Minister for Employment and Workplace Relations and then Minister for Health. But Hockey eventually ended up being chosen to sell WorkChoices as Minister for Employment and Workplace Relations. He has done better in Opposition, while Abbott's star has waned. Hockey, the Shadow Treasurer, is now Abbott's political senior. There are two important areas of difference. One is electoral appeal. Hockey is more popular in the electorate. Hockey, co-star with Kevin Rudd on the Channel 7 Sunrise Program until it was cancelled because his party colleagues thought the friendship was unbecoming, has an outgoing manner that appeals to the public. The big friendly bear of a man is attractive to both sides of politics. 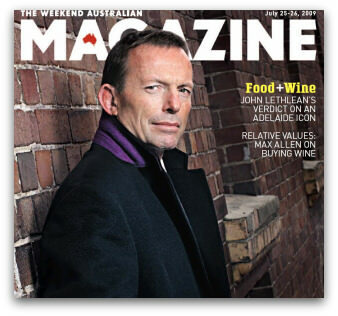 The gaunt-looking Abbott, on the other hand, suffers from his aggressive, adversarial stance and his image as an ideologically conservative Catholic unwilling to compromise. He is a divisive rather than inclusive figure. The second difference is that Hockey is a member of the Liberal Left and Abbott is part of the Liberal Right. In some ways a contest between them would be a repeat of the Turnbull/Nelson clashes, with the Left backing Hockey and the Right backing Abbott. But the ideological gap between the two may be bigger. Abbott is probably to the right of Nelson and Hockey is arguably to the left of Turnbull. Abbott is a pragmatist and thinks strategically, as shown by his current support for passing the government's emissions trading scheme in order to avoid a double dissolution election. But at heart he is conservative. His conservatism is primarily social, on issues like abortion and embryonic stem cell research. His proposal, in his new book Battlelines, to reintroduce fault into divorce law for those couples who choose to do so, is unlikely to appeal to voters in the middle of the political spectrum. Hockey, on the other hand, is a liberal Catholic. When Cardinal Pell took issue with Catholic MPs in the NSW Parliament over embryonic stem cell research, Hockey, who had supported embryonic stem cell research in the Federal Parliament, responded that while he didn't object to the Cardinal expressing his opinion, he did object to the suggestion that there could be consequences for a parliamentarian's standing within the church. Like Turnbull, Hockey is pro-choice. When he entered Parliament he joined the John Stuart Mill Society, a grouping of progressive Liberals, rather than the conservative Lyons Forum. That was a brave statement. Hockey, like Turnbull, would be unacceptable to many conservative Liberals. There is more to both men than can be conveyed in a few words. The leadership contest would be fascinating were it to come about. Should the opportunity arise Hockey, the younger man, may even decline what he would see as a poisoned chalice. But Abbott wouldn't. He would grab his chance and a boots-and-all election would certainly follow because Abbott, unlike Hockey, is outspoken in his personal criticisms of the Prime Minister. John Warhurst is a Canberra Times columnist and Adjunct Professor of Political Science at the Australian National University and Flinders University. The dominance of Catholics in leadership positions in a political party that once had only Phillip Lynch to counter a charge of sectarianism is intriguing. Hockey, Abbott, Nelson, Pyne, McGauran, Barnaby Joyce (all Jesuits educated? ), Turnbull, Heffernan ... more no doubt. What would Mannix think? Mannix would love it, Frank, because he would be voting Liberal himself now. The 1996 election was the first time more Catholics voted for the Coalition than the ALP. Since Catholics have joined the Protestant-established Establishment in this country - they are just as likely to vote for the Coalition as they are Labor. I find it puzzling that having respect for human life is described as conservative and lacking it is progressive. I am a lifelong Catholic, for more than 70 years now. I believe in Aboriginal rights, acceptance of boat people, freedom for the Tibetans and Uighurs and West Papuans, unionism. A couple of years ago someone addressed me as 'You old leftie'. If the Catholic Church changed its attitude on abortion and embryonic stem-cell research, I think I'd leave the church, because they're both so obviously wrong. So am I progressive or conservative, left or right? Or are the terms meaningless? 'Consequences for a parliamentarian's standing within the Church' is an interesting phrase. Could Mr Hockey have felt that he was being threatened with ex-communication as a result of 'the Cardinal expressing his opinion' about 'embryonic stem cell research', which Mr Hockey supports? Cardinal Pacelli (later Pius xii) failed to express his opinion of Nazism to Adolf Hitler and even entered the Vatican into a Concordat with Hitler's Third Reich in 1933. Under this Concordat the Church had to withdraw from political activity within Hitler's Germany. What followed were the death camps and the holocaust.Tony Abbott is a man of principle, unsullied by compromise.When Australia's darkest hour comes, it will be to men like Tony Abbott to whom we will look for courageous leadership. As someone who was educated by the Jesuits, I sometimes wonder whether they cringe about their former charges in public life, particularly divisive figures such as Abbott and Barnaby Joyce, not to mention the likes of Pat Buchanan, Robert Mugabe and Castro. Heaven preserve us from Tony in a leadership position. He is welcome to his principles, but the problem with Tony is that he would seek to impose them on others, as he has done previously in the health portfolio. @ Claude Rigney: "when Australia's darkest hour comes...." geez luiz that sounds very depressing. I think it's a bit early for Joe Hockey to be thinking about the leadership at this point - it would be a poisoned chalice as the author says. I believe he is a good potential leader but needs a little bit more experience in the "rough house" that is parliament! The boys of Lebanon have found a niche in Aussie pop culture. Several recent films deal with Arab-Australians as the 'other', examining the extent of their assimilation, the codes they live by, and their functions within a 'tolerant' society. It's not uncommon for celebrities to get involved in charity work. Ian Thorpe's monumental speech to the Beyond Sport Summit in London articulating his resolve to tackle Indigenous disadvantage suggests he is far ahead of the pack.